Miniatures or small portraits already existed in antiquity as finds in Pompeii prove. In the 16th century, there were numerous miniaturists working in England, which stood under the influence of the Augsburg artist Hans Holbein the Younger, who played a major role at the English royal court. The second heyday of English miniature painting began around 1760 and lasted until about 1800. At this time, an important discovery was made, the use of thin, almost transparent ivory allowed artists to achieve new effects using transparencies and paints. Little is known about the miniature painting in Austria in the 17th and 18th centuries, Jean Etienne Liotard came to Vienna during the reign of Maria Theresa and left us a variety of enamel and pastel works that are partly in the portraits collection of the National Library in Vienna. Born in Heilbronn in 1751, Heinrich Friedrich Füger is considered to be the most important Viennese artist of the 18th century, apart to his function as director of the Academy of Vienna. He died in Vienna in 1818. The Congress of Vienna of 1814, a social event that put Vienna at the center of Europe, led many foreign artists to come to Vienna. The most famous among them were Thomas Lawrence and Jean Baptist Isabey. 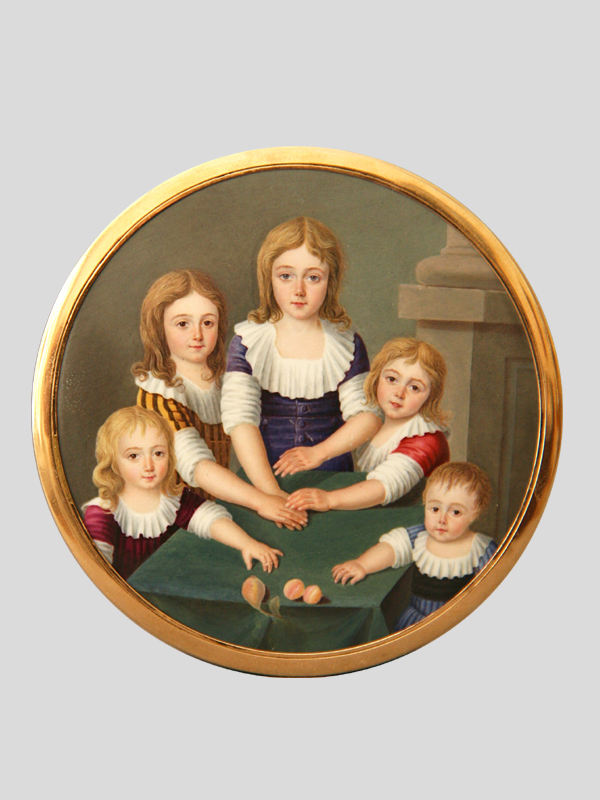 They exerted great influence on the development of Austrian miniature painting. The works of Johann Nepomuk Ender, Carl Josef Agricola and Friedrich August Lieder show us that Jean Baptist Isabey served as a great role model. The most important Austrian artist, Moritz Michael Daffinger (1790-1849), who was highly esteemed at home and abroad, was so pleased with Lawrence’s works that he decided to acquire his technique. In his estate, which was auctioned off in 1921, there were scrapbooks by the artist and portraits, which Daffinger copied throughout his life. He depicted people in a similar posture, and used the same backgrounds and colours. The artist became a member of the Academy of Vienna in 1836 and in 1839 honorary member of the Academy of Milan. The zenith of his successes in the 1830s was marked by the prestigious orders of State Chancellor Metternich and his wife Melanie as well as their circle of friends. After the death of his only daughter Mathilde he devoted himself to the local flora. The resulting 415 watercolors are kept in the print room (Kupferstichkabinett) of the Academy of Fine Arts Vienna. 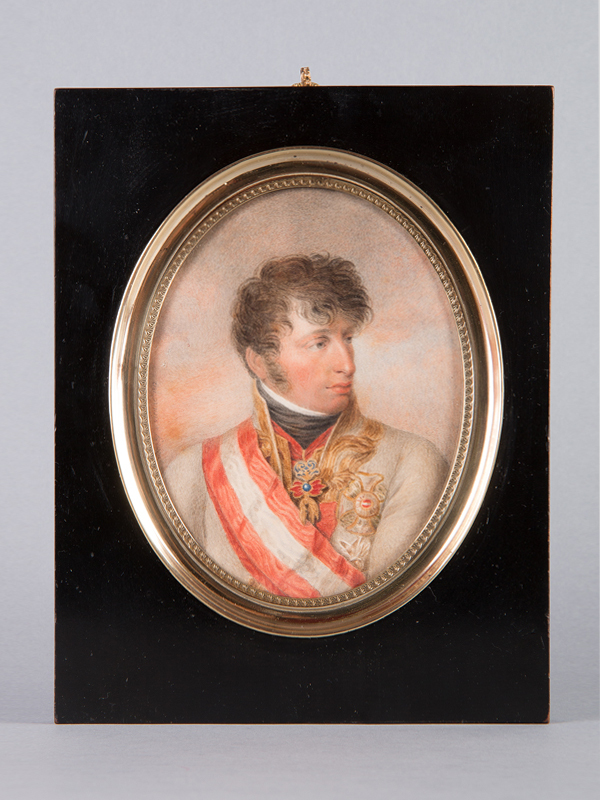 His portrait miniatures are defined as ‘feminine grace and beauty with lyrical romantic expression’. He influenced the entire Austrian school of his time sustainably. Daffinger was copied throughout his life by Emanuel Peter, and the artist’s works were set in the typical fire-gilded Blondell frames. Furthermore, the later artists Alois Anreiter, Robert and Adolf Theer, Richard Schwager, Friedrich Wailand have to be mentioned in this context. Among the watercolor painters, who represented the nobility and the upper bourgeoisie, were Josef Kriehuber, Johann Nepomuk Ender, Leopold Fischer, Franz Eybl, Peter Fendi. The great Ferdinand Georg Waldmüller, known for his genre scenes in the woods of Vienna, occasionally created miniatures and wonderful watercolor portraits. Literature: Parnass 2/1982, book 1, year II, pp. 18-23.